This week, Trump’s frustration with migrants coming to the southern border boiled over, as he purged the Department of Homeland Security, and empowered immigrant hardliner Stephen Miller to be in charge of the regime’s immigration policy. As the week ended, 12 of the 30 senior roles at DHS were either vacant or filled with “acting” leaders. Departures of senior officials at the cabinet level and below are at record levels. Meanwhile, Trump continues to consolidate power, act unilaterally, and welcome the “flexibility” of using “acting” directors whom he can hire and fire at will — without needing the oversight of the Senate to confirm them. “If Kirstjen only had a heart, she wouldn’t have been hired in the first place.” A quote from Jim Carrey, to go along with his depiction of the OUSTED TIN WOMAN this week. Troubling reporting this week indicated Trump instructed his incoming Secretary of DHS to break the law, assuring him he would be pardoned. Reporting also indicated Trump and Miller had contemplated releasing migrant detainees into sanctuary cities as a means to punish political enemies. When confronted with the story, the White House pushed back, only to have Trump say indeed that was his plan. Trump also looked for ways to increasingly use military troops at the border, including in ways that violate the law. Attorney General William Barr delivered concerning Congressional testimony, refusing to answer if he has briefed the White House on the Mueller probe, and said he believed “spying” by the FBI on the Trump campaign did occur. Trump seized on Barr’s words to claim he was a victim of an “attempted coup,” and continued this week to discredit Mueller and his team. Three weeks after Mueller delivered his report to Barr, it has yet to be released to Congress or the American people. Jim Carrey’s latest depiction of the most dangerous, unlawful man in the country. And that says a lot, considering who the president is. But, I dare to say that 45 is stupid, can barely read, and has never known the law. Barr, however, does know the law, he just chooses to BREAK IT. That is what makes him the MOST DANGEROUS. On Sunday, Trump renewed his attacks on Mueller, tweeting: “Looks like Bob Mueller’s team of 13 Trump Haters & Angry Democrats” are illegally leaking information to the press. Axios reported former White House counsel Don McGahn told a group of senior Republican Senate aidesTrump uses a “hub and spokes model” — with no staff member empowered and Trump making all the decisions. On Sunday, Homeland Security Secretary Kirstjen Nielsen resigned, bowing to pressure from Trump over his frustration over the failure to stop the flow of immigrants crossing the southern border. Trump tweeted about her resignation, with her formal letter following shortly after. Tension between the two was exacerbated by Trump withdrawing Ronald Vitiello’s nomination to be the director of ICE without consulting Nielsen last week. Fox News’ anchors had repeatedly called for Nielsen’s resignation in recent weeks. DHS is the subject of numerous House subpoenas and more than 20 investigations by the agency’s inspector general. Nielsen’s resignation marked the 15th Trump cabinet member to depart — a faster turnover pace than Obama, W. Bush, or Clinton, as nearly 50 senior officials have departed since Trump took office. Nielsen was also the third woman to resign from Trump’s cabinet, leaving just three women out of 24 positions — the least diverse cabinet by gender since President Reagan. On Monday, NBC News reported Trump’s renewed support for months of reinstating large-scale separation of migrant families crossing the border put him at odds with Nielsen and was part of what led to her resignation. Nielsen told Trump federal court orders prohibited DHS from reinstating the policy. Kevin McAleenan, the head of Customs and Border Protection whom Trump is likely to name secretary, has not ruled out family separation. On Monday, Randolph “Tex” Alles was removed as U.S. Secret Service Director. After his departure, Alles sent a message to the Secret Service saying he had not been fired by Trump. Alles reported to Nielsen. Alles was a retired Marine Corps general and former acting deputy commissioner of CBP — the first Secret Service Director not to come up the agency ranks in at least 100 years, and the latest general to depart. On Monday, Sen. Chuck Grassley warned Trump to stop ousting top immigration officials, saying he was “very, very concerned” Lee Francis Cissna, director of Citizenship and Immigration Services, could be next. Reports indicated Cissna and DHS’s general counsel, John Mitnick, could be the next to go in Trump’s purge of DHS leaders. Grassley told WAPO he planned to go on Fox News to make his case for keeping Cissna. On Monday, WSJ reported Trump has been pushing to reinstate the family separation policy since the day it stopped. Recently, Trump reportedly told Stephen Miller: “You’re in charge” of the regime’s immigration policy. CNN reported in an Oval Office meeting three weeks ago, Trump, while “ranting and raving” ordered Nielsen and Secretary of State Mike Pompeo to shut down the port of El Paso the next day. Mulvaney talked him out of it. Also, last Friday during his visit to Calexico, Trump reportedly told border agents to not let migrants in. When Trump left, their leaders said if they did so, they would take on personal liability, and to instead follow the law. On Monday, a federal judge issued a preliminary injunction blocking a Trump regime experimental policy requiring asylum seekers to remain in Mexico while their cases made their way through immigration courts. Under the policy known as Migrant Protection Protocols (MPP), several hundred migrants had been returned to Mexico. The judge’s ruling took away one of the regime’s remaining tools to stem the flow of migrants. On Monday, Florida Congresswomen Debbie Wasserman Schultz, Debbie Mucarsel-Powell, and Donna Shalala vowed to take legal action against the regime after they were denied entry to the Homestead facility in Miami. On Tuesday, Trump told reporter he was continuing an Obama policy, saying “Obama had child separation,” adding, “Obama had the law. We changed the law.” The claim that Obama separated families is false. On Tuesday, NYT reported the Trump Organization has begun to quietly take steps to eliminate any remaining undocumented workers from its workforce at its properties in South Florida, facing charges of hypocrisy. Seven veteran maintenance workers at Trump National Jupiter were told they had to show proof of legal residency to keep their jobs. Only one was legal — and six were from El Salvador, Guatemala, Honduras, and Mexico. On Tuesday, Claire Grady, the acting number two at DHS, resigned in the evening. Grady had 28 years of experience at the Departments of Homeland Security and Defense. Nielsen tweeted out Grady’s resignation. TIME reported Grady, who was next in line to become acting secretary, was forced to resign as Trump chose Kevin McAleenan to take the role. On Wednesday, Ronald Vitiello, who was acting director of ICE since June 2018, and had his nomination to head ICE suddenly withdrawn by Trump last week, told staffers his last day of work will be on Friday. Described as a “purge” of DHS leadership, roles of Secretary, Deputy Secretary, Under Secretary for Management, CBP Commissioner, ICE Director, Secret Service Director, and FEMA Administrator were vacant. Overall within DHS, 12 of the 30 leadership positions on the department’s organization chart are “vacant” or filled by an “acting” leader. Several Senate Republicans publicly expressed concern about the purge at DHS, and the growing leadership void. Several, including Majority Leader Mitch McConnell praised Nielsen on her way out. WAPO reported Trump’s agencies have spent much more time being led by acting directors than any in history — and with Nielsen’s departure, he has the second most acting agency heads in modern history. Acting roles included: DHS, Interior Secretary, Budget Director, Chief of Staff, U.N. Ambassador, FEMA Administrator, ICE Director, administrator of the Small Business Administration, and CBP Commissioner. Trump has said he likes to have acting directors, saying in January: “It gives me more flexibility. Do you understand that? I like acting.” Acting directors have become a feature of the Trump regime. On Thursday, Trump named acting deputy director Matthew Albence, an immigration hardliner who has compared migrant detention centers to “summer camps,” to become the director of ICE. On Thursday, WAPO reported White House officials pressured U.S. immigration authorities to release detainees onto the streets of “sanctuary cities” to retaliate against Trump’s political adversaries. According to DHS officials and emails reviewed, the Trump regime has proposed doing this at least two times: in November with “caravans” approaching and in February during his standoff with Democrats. The Trump regime considered targeting Speaker Nancy Pelosi’s district and other Democratic strongholds, and told ICE the plan was meant to alleviate a shortage of detention space and to send a message to Democrats. A whistleblower told the Post the Trump regime believed it could punish Speaker Pelosi and Democrats by busing detainees into their districts before their release. Stephen Miller discussed the proposal with ICE. Trump tweeted he is considering this plan “due to the fact that Democrats are unwilling to change our very dangerous immigration laws,” adding, “The Radical Left always seems to have an Open Borders…so this should make them very happy! On Friday, NBC News reported that at a Tuesday meeting of Trump’s top national security advisers at the White House, advisers discussed increasingly military involvement at the border. Advisers discussed using the military to build tent city detention camps for migrants, and also whether the military could run the camps. U.S. law prohibits the military from directly interacting with migrants. The military may also be used to assess land before the construction of new tent cities in Texas. A new processing center is also being built similar to the one in McAllen, where children were kept in cage-like areas. The new tent cities will hold the overflow, while ICE detention facilities are at capacity. An official said using the military allows for faster construction than private contractors, who can protest decisions. On Friday, NYT reported that Trump privately urged Kevin McAleenan, during his visit to Calexico last week, to close the southwestern border to migrants, despite Trump saying last week he would delay for a year. Trump also reportedly told McAleenan he would pardon him if he encountered legal challenges for closing the border. Federal judges have blocked the regime’s efforts to limit asylum as unlawful. Nielsen had refused to carry out Trump’s order to close the border, saying it was not illegal. Trump told McAleenan to disregard Nielsen’s concern. Two days later she resigned. Trump has been eager to stop immigration. A spokesman for the Department of Homeland Security told the Times, “At no time has the president indicated, asked, directed or pressured the acting secretary to do anything illegal,” adding nor would they. On Tuesday, Republicans on the House Judiciary Committee released a 152-page transcript of former FBI general counsel James Baker, as part of entering testimony from last year’s investigation into the congressional record. Baker also told lawmakers there was widespread concern inside the FBI that Trump had attempted to obstruct the investigation into his campaign’s links to Russians when he fired former FBI director James Comey. Baker testified he was told by former Deputy FBI Director Andrew McCabe that Rod Rosenstein told McCabe two members of Trump’s cabinet had endorsed the notion of invoking the 25th Amendment to remove Trump from office. Baker also said last October that he not did think deputy attorney general Rosenstein was joking about wearing a wire or invoking the 25th Amendment — but that he did not connect the two discussions. On Tuesday, Barr testified before the House Appropriations Committee for 2 1/2 hours. Barr said the Justice Department will release the Mueller report “within a week,” reiterating his promise of a mid-April release. Barr admitted Mueller’s team may have preferred for him to release more information up front, and they “did not play a role in drafting” his letter. Mueller was offered to review the letter, but declined. Barr said he would redact grand-jury material, information on intelligence sources and methods on ongoing investigations, and details that would affect the privacy of people “peripheral” to Mueller’s investigation. Notably, Barr refused to answer whether whether he has briefed the White House on the report. He said he would color-code redactions, so the reason would be more clear. Barr said Congress will not receive the unredacted report, and that he will not ask the judge for an exception in order to release secret grand-jury information to Congress. Barr also asked the committee for an additional $72.1 million to fund 100 new immigration judges, but claimed he was “not familiar with” discussions of Trump’s renewed push to separate families at the border. On Tuesday, Bloomberg reported Barr has assembled a team to review counterintelligence decisions made by DOJ and FBI officials, including actions taken related to the Trump campaign in the summer of 2016. On Monday, Guardian reported the Trump regime has quietly withdrawn federal funding for Landscape Conservation Cooperatives, a large conservation program, putting years of scientific study at risk. On Tuesday, Twitter disabled a video tweeted by Trump featuring “The Dark Knight” music, after Warner Bros. said it would be filing a copyright infringement complaint. On Tuesday, Fox News reported Rep. Devin Nunes filed a $150 million lawsuit against The McClatchy Company, alleging it conspired to derail his oversight of the Clinton campaign and Russian election interference. On Tuesday, in House appropriations subcommittee testimony, Treasury Secretary Steven Mnuchin revealed lawyers from his agency consulted with the White House general counsel’s office about Trump’s tax returns. Conversations took place before the House Democrats made their request for Trump’s returns. Mnuchin said he personally did not participate in the conversations and was not briefed on the discussions. On Tuesday, YouTube disabled comments on a livestream of a House Judiciary Committee hearing on hate crimes and white nationalism on social media, after being flooded with racist and anti-Semitic comments. What was meant to be a serious inquiry by the committee devolved into a circus type atmosphere when Republicans invited Candace Owens, a 29-year-old African American provocateur to testify. On Tuesday, more than 80 House Democrats unveiled a resolution condemning white supremacy at a news conference. Although the sponsors did not name Trump, they referenced the impact of his rhetoric. On Tuesday, the Charlotte Observer reported Brandon Lecroy, a 26 year-old white man, was sentenced to 10 years in prison for trying to hire a hitman from the South Carolina Klu Klux Klan to kill a black neighbor. On Tuesday, the president of the NAACP called a series of four suspicious blazes at historically black churches in Louisiana in a 10-day span an act of “domestic terrorism” emboldened by racial rhetoric across the country. KVUE ABC News reported a principal in Austin, Texas was removed after allegations she discriminated against immigrant parents and joked in a newsletter about Trump’s “Make America Great Again” campaign slogan. On Wednesday, WAPO reported the Texas House heard debate on a bill that could impose the death penalty for women who get abortions. A similar measure was not brought up for debate in 2017. WAPO reported students at George Mason University, including sexual assault survivors, have petitioned school leadership to remove Supreme Court Justice Brett Kavanaugh from teaching and issue an apology. On Thursday, Forbes reported a new policy proposal being considered by the Trump regime would monitor the social media profiles of disabled people and flag content that shows them doing physical activities to root out false claims. On Wednesday, a man wearing a Trump t-shirt yelled disparaging words at members of a Muslim communitygathering at one of the mosques targeted in the Christchurch terror attack in New Zealand. On Thursday, the New York Post cover featured a take-off of a partial quote by Rep. Omar — “some people did something” — writing “Here’s your something,” with a photo of the Twin Towers after the planes hit. Shortly after, Sen. Elizabeth Warren tweeted Trump “is inciting violence against a sitting Congresswoman– and an entire group of Americans based on their religion,” and called on other elected officials to condemn it. On Saturday, other Democrats came to Rep. Omar’s defense, saying Trump’s tweet was endangering her life. Trump pinned the tweet to his profile to highlight it. On Friday, the Houston Chronicle reported Laura Maradiaga, 11, who was apprehended in October 2018 along with her mother and sister, could be deported back to El Salvador without her family because of a clerical error. On Tuesday, Democratic chairs of five House committees sent a letter to the White House, DOJ, and top regime health officials seeking information on the shift in the DOJ’s legal strategy on the Affordable Care Act. The letter noted the DOJ seeking the elimination of the ACA constituted a “sudden and significant reversal” that violated the federal government’s long standing precedent of defending its own laws. On Wednesday, Rep. Matt Gaetz introduced the “PENCIL” resolution, after Trump referred to Rep. Adam Schiff as a “pencil neck,” calling for Schiff to be ousted as committee chair and have his security clearance revoked. On Wednesday, House Oversight Committee Chair Elijah Cummings threatened in a letter to Barr to hold John Gore, a principal deputy assistant attorney general, in contempt of Congress. Rep. Cummings said in his letter that Barr appears “to be instructing” Gore “to defy a duly authorized congressional subpoena” requesting his testimony about a citizenship question added to the 2020 census. On Wednesday, at a Senate Appropriations Committee subcommittee budget hearing, Barr seemed to embrace talking points used by Trump’s Republican allies casting doubt on the origins of the Mueller probe. When pressed, Barr said, “I have no specific evidence that I would cite right now,” saying he was not launching an investigation of the FBI, but “there was probably a failure among a group of leaders” at the upper echelon. When asked specifically whether the Mueller investigation was a witch hunt, Barr responded, “it depends on where you sit,” adding people who were “falsely accused” could see it that way. At the same time, Trump spoke to reporters on the White House South Lawn, saying the investigation into Russian election interference and obstruction of justice was “an attempted coup” against his presidency. Trump also said it “all started, because this was an illegal witch hunt,” adding, “there were dirty cops, these were bad people,” naming former FBI officials Comey, McCabe, Peter Strzok, and Lisa Page. On Wednesday, including Speaker Pelosi, all four Democratic members of the Gang of Eight condemned Barr’s comments about intelligence officials “spying.” The four Republicans did not comment publicly. On Thursday, Rep. Nunes told Fox News host Sean Hannity that he plans to meet with Barr to send eight “criminal referrals” against individuals involved in the investigation of Trump’s 2016 campaign. Barr told lawmakers “I haven’t seen the referrals yet” but added “if there’s a predicate for an investigation it’ll be conducted.” Nunes was formerly chair of the House Intelligence Committee (recused then returned). Trump also retweeted a video from Fox Business host Lou Dobbs claiming his approval was up to 55%, tweeting “Great news! #MAGA.” His actual approval was 43% — the 55% was actually Trump’s disapproval number. On Monday, New York Gov. Andrew Cuomo said he would support a bill that would permit the NY Dept of Taxation and Finance to release any state tax returns requested by leaders of three congressional committees. On Tuesday, Trump’s IRS commissioner, Charles Rettig, told the House Appropriations Committee during testimony that there are no rules prohibiting taxpayers under audit from releasing their tax information. On Thursday, the Illinois state senate passed a bill requiring presidential candidates to release five years of tax returns in order to get on the ballot in 2020. Similar legislation is in play in 17 other states. On Wednesday, Mnuchin said in letter to House Ways and Means Committee Chair Richard Neal that the Treasury would miss the deadline for Trump’s tax returns, and would consult with the DOJ on how to proceed. On Tuesday, the Guardian reported recent filings reveal a new DOJ stance on the emoluments clause, allowing Trump to accept unlimited amounts from foreign governments if it comes through commercial transactions. The new stance would exempt Trump’s hotels, including Trump Hotel DC. The DOJ shift started in June 2017, and now closely paralleling arguments made in a January 2017 by Trump Organization lawyer Sheri Dillon. On Tuesday, Public Citizen, a consumer advocacy group, sued the Department of Education and Secretary Betsy DeVos, claiming the agency is blocking access to its website, in violation of the First Amendment. On Monday, Roll Call reported recently posted versions of acting Interior Secretary David Bernhardt’s daily schedules contained at least 260 entries differing from his original schedules. In the newer version, meetings previously described as “external” or “internal” were actually meetings with representatives of the fossil fuel, timber, mining, and other industries. The new schedule included a keynote address at the Trump Hotel DC for Domestic Energy Producers Alliance, meetings with oil company executives, and a group focused on weakening the Endangered Species Act. On Thursday, Bernhardt was confirmed by the Senate as Interior Secretary, even as more than a dozen Democrats and government ethics watchdog groups called for formal investigations into his past conduct. On Thursday, Wikileaks founder Julian Assange was arrested after being expelled from the Ecuadoran Embassy on U.S. hacking charges, seven years after his group published classified information on the internet in 2010. U.S. officials acknowledged they had secretly charged Assange last year with conspiring with Chelsea Manning to illegally obtain secret U.S. military and diplomatic documents, by hacking a government password. Assange’s lawyer said he will fight extradition to the U.S. She called the action against him “a dangerous precedent for all news media.” Assange was told by the Ecuadoran ambassador his asylum was being revoked. In Mueller’s indictments of 12 Russian military intelligence officers, he charged they “discussed the release of the stolen documents and the timing of those releases” with WikiLeaks. Assange has not been charged. The indictment said stolen emails were released “to heighten their impact on the 2016 presidential election.” Wikileaks began releasing emails on the same day in October 2016 the “Access Hollywood” tape surfaced. Lawmakers from both parties condemned Assange and called for his immediate extradition for hacking classified information and his role in the 2016 election. He will face extradition hearings on May 2 and June 12. On Wednesday, CNN reported Jeff Bezos will meet with federal prosecutors in New York, indicating the inquiry into Saudi Arabia’s involvement with the National Enquirer story is moving forward. On Thursday, Gregory Craig, former Obama White House counsel, was charged with lying to federal prosecutors about legal work for Ukraine he did for Paul Manafort while a partner at law firm Skadden, Arps. Craig was charged with two felony counts for alleged false statements made to DOJ officials and later Mueller’s prosecutors over whether he should have registered as a foreign agent. The case grew out of the Mueller probe. Legal experts noted the charges indicate cases farmed out from the Mueller probe could continue to yield newevidence and even more charges for months or even years. On Monday, prosecutors told the judge that Sam Patten, a lobbyist who steered foreign money to Trump’s inaugural campaign, provided “substantial assistance” to Mueller and other investigators, asking for no jail time. On Friday, Patten was sentenced to three years of probation with no jail time. Patten pleaded guilty in August, and has cooperated with still unknown investigations which grew out of Mueller’s work. On Wednesday, a court filing revealed Trump’s older sister, Maryanne Trump Barry, 82, retired as a federal appellate judge after an investigation was opened into whether she violated judicial conduct rules. The investigation came after four citizens filed complaints arising from a NYT story from October which alleged Trump and his siblings evaded inheritance taxes by participating in fraudulent tax schemes. In February 2017, Barry told the court that she would stop hearing cases, without specifying the reason why.By retiring, she ends the court inquiry into her role in the tax scheme. On Wednesday, Benjamin Netanyahu narrowly won re-election for a fifth term as prime minister of Israel, securing 65 of the 120 seats in Parliament. Several world leaders, especially nationalists like Trump, rushed to congratulate Netanyahu. On Thursday, in an Oval Office meeting with South Korean President Moon Jae-in, Trump told reporters he is considering a third nuclear summit with North Korea’s Kim Jong Un. On Friday, Herman Cain withdrew his name from consideration for appointment to the Federal Reserve, after several Republican senators came out against his potential nomination. Moore said in February Federal Reserve Chairman Jerome Powell was one of Trump’s “worst appointments” and said hundreds of employees at the Fed whom he called “worthless” economists should be fired. On Friday, WAPO reported federal investigation found rampant sexual harassment and retaliation at AccuWeather under the leadership of Barry Myers, Trump’s nominee to lead the National Oceanic and Atmospheric Administration. Trump nominated Myers in 2017, but his nomination stalled in the Senate. Republican leaders had planned to renominate him without a hearing, despite ethics concerns raised when he first went through the process. On Friday, Democratic Sens. Patty Murray and Tim Kaine demanded in a letter that the DOJ “make public all findings” of an investigation into Labor Secretary Alexander Acosta’s conduct in the Jeffrey Epstein case. On Friday, in a memo to his committee, Rep. Cummings said he is moving forward on Monday to issue a “friendly” subpoena to accounting firm Mazars USA to obtain 10 years of Trump’s financial records. On Friday, after a lengthy battle with multiple federal court injunctions, Trump’s controversial transgender military ban took effect. Trump first tweeted about the idea of the ban in July 2017. The version of the ban that went into effect prohibited new military recruits from transitioning, and also allows the military to discharge troops who do not present as their birth gender. On Friday, prosecutors indicted Yujing Zhang, who was arrested on the ground of Mar-a-Lago, on charges oflying to a federal officer and entering restricted grounds, but does not include espionage charges. The Miami Herald reported a source claims Zhang knew before leaving China that the function she claimed she was attending had been canceled. Zhang will likely move to a detention and be scheduled for deportation. On Saturday, in a letter, House Ways and Means Committee Chair Richard Neal gave the IRS a deadline of April 23 to turn over Trump’s tax returns, threatening otherwise to bring the dispute into federal court. Mnuchin, who oversees the IRS, cited “complicated legal issues” and complained of the “arbitrary deadline” set by House Democrats, but said he would answer in that time frame. The Weekly List podcast is here! You can find more information here by clicking here. THE LIST — weeks 1–52 of The Weekly List is out as a book! You can order your copy by clicking here. 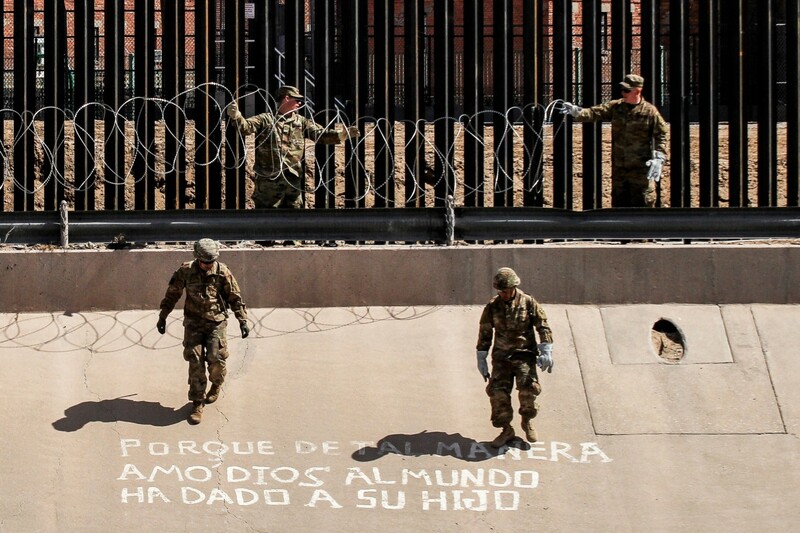 U.S. soldiers install barb wire by the US–Mexico border fence reading ‘Because in such way God has loved the world he has given his son’ in El Paso, Texas state, US, as seen from Ciudad Juarez, Chihuahua state, Mexico. And the scariest moment, in my opinion, of this entire regime, was yesterday’s video from 45 basically rallying his base to direct their ire towards this great American Muslim woman, Ilhan Omar. And we’ve seen what his base is capable of doing, with their vans and their guns and their red hats…ALL THE WHILE, the sickest video emerged of 45 himself bragging that his building was “now the tallest in NYC,” as the towers recently burned to the ground…He does not care about America, people. If you are with him, you are VOTING AGAINST YOUR BEST INTERESTS. 3apr19. San Jose, Costa Rica 🇨🇷. 3apr19. San Jose, Costa Rica.